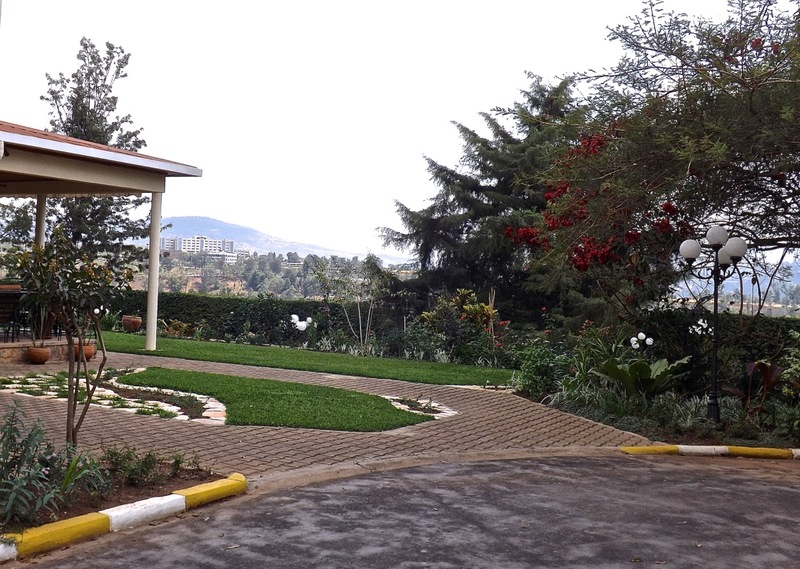 It’s been some time since I posted the site analysis of our Kigali garden — it was July, in fact. It’s been difficult for me to write about the changes we’ve made since then. I take pictures, look at them and feel that they look so raw and empty — because newly divided, transplanted shrubs and perennials never present that well, especially here, where I can’t run down to a garden center for a few bags of chipped mulch. So I reject them and go out and move some more plants around, hoping the next set of pictures will really represent the improvements that we’ve made this summer. 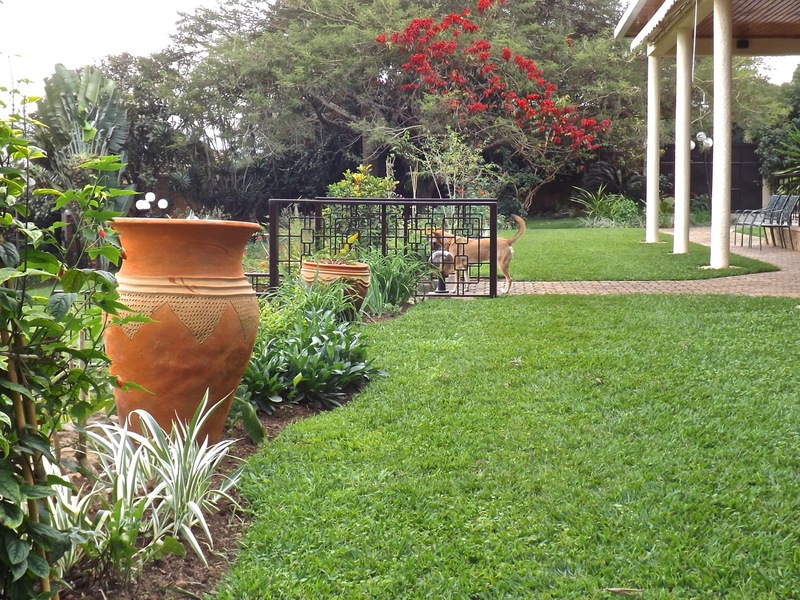 But I’ve reached the point where I need to stop fiddling with things and just let the garden grow on its own for a while (and it will: the rains have started and the gardener just spread two truckloads of manure this week). So I went out this week and took more photos and then made the sketch below so that they will make more sense. 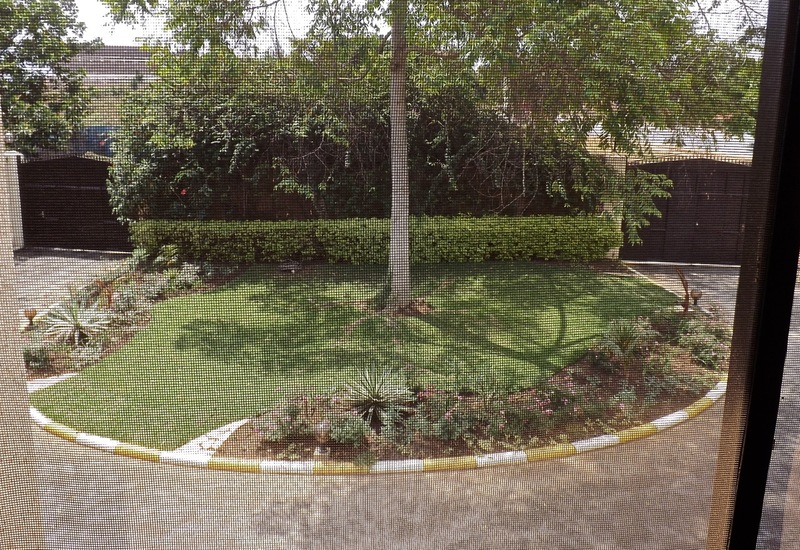 The unifying element for the upper and lower areas in front of the house and near the side driveway is an irregularly curving line (of planting bed) against a straight line (of clipped bougainvillea hedge, stone wall, or pavement). 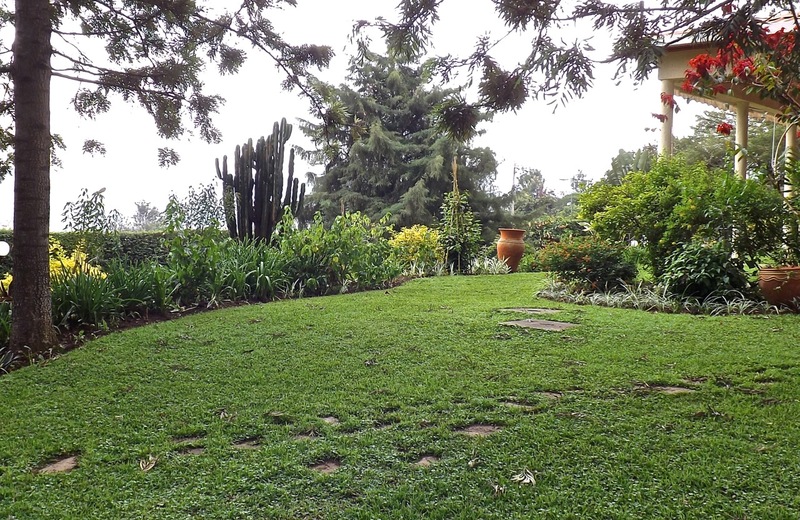 So this garden layout may make you think of water (if you grew up near a bay or ocean like me) or the hills and mountains (if you grew up in a place like Rwanda). Either way, it seems to be working nicely, although I will make a few adjustments to the curves in the next couple of months. It’s harder to draw convincing irregular waves on the ground than I first thought. Below is a panoramic photo I took from the terrace, just out from the front door of the house. The camera distorts the scene into a wide angle, so please imagine it as straight across (and click the photo to enlarge it). You can just see the hills in the distance over the front hedge. The picture shows how open this area is since we removed the two rows of 4′ hedges that ran along the front of the terrace. 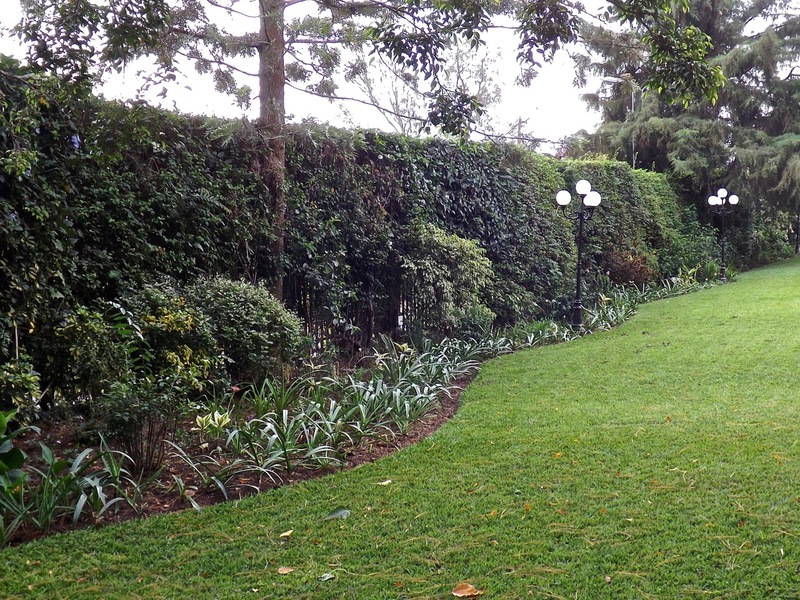 We replaced them with grass — and with a very narrow planting bed just along the first retaining wall. This gives us a bigger entertaining area near the house. We get a better breeze and fewer mosquitoes at night, as well. We also removed all the 6’+ false bird of paradise plants that grew on either side of the handrails and blocked the wonderful view of the city. I feel like I can really breath now, and it’s such a pleasure to come downstairs every morning to increased light and air. 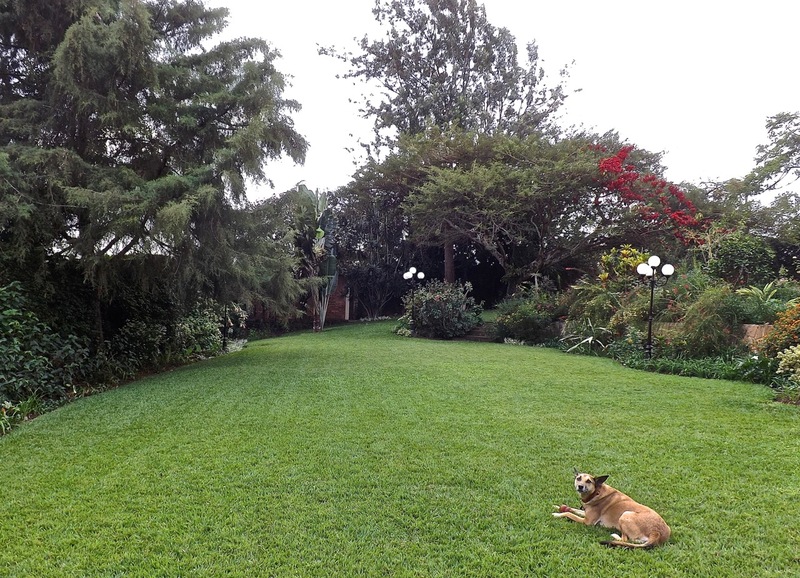 The photo below shows the length of the new grassy area as you look toward the driveway (and also see a bit of our summer loaner dog, Riley — we have been dog-sitting). Below you can see some of the same area looking in the other direction, standing at the center handrails. 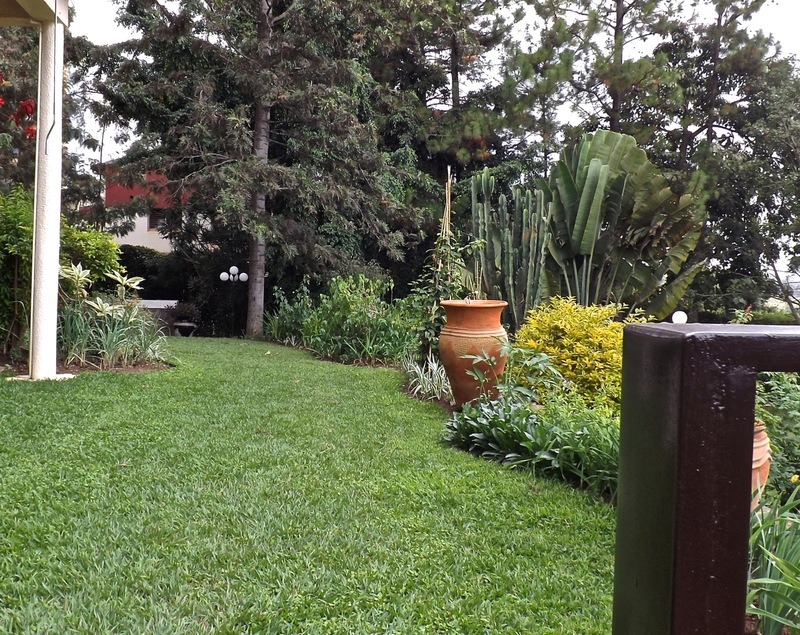 As we cut new, wider planting beds from the lower lawn, we transferred the sod right up to this top area, so the grass has looked good from the beginning. 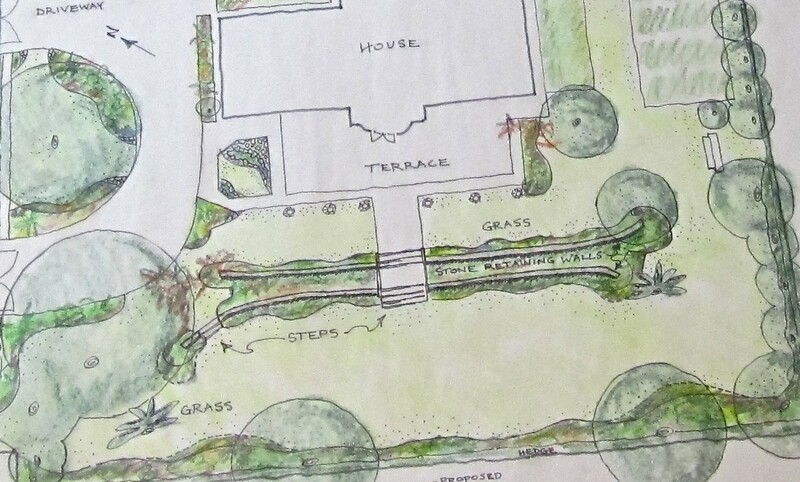 Now, if we back up to the left edge of the drawing above, to the top gate that is the entrance to the property, you can see, below, how we have created two planting beds in the semi-circular area between the two gates. They replace a very narrow bed that ran all the way around, along the edge of the driveway. Now guests can actually enter this center area on the gate side and cross directly to the house on the grass if they choose. Below, you can see the layout from the upstairs porch. The yellow and white curbs were painted while we were on vacation in March (without consulting us); I’m just not thinking about them right now. 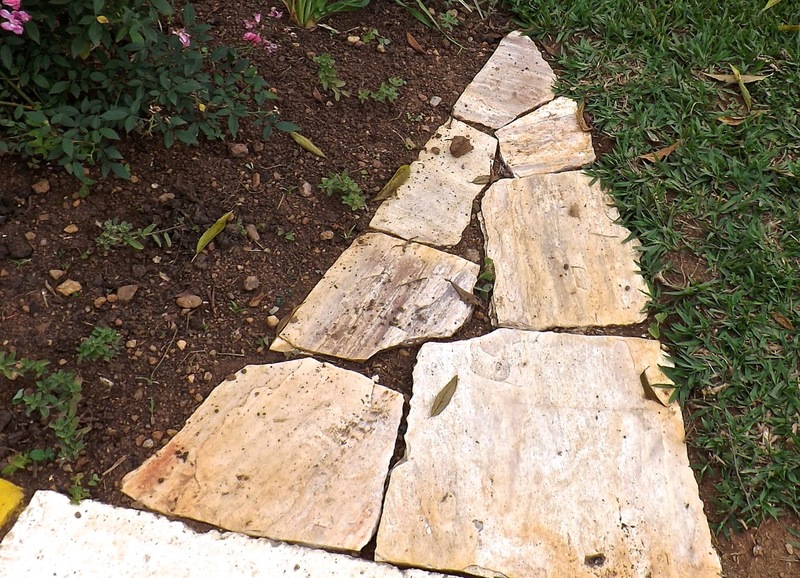 We also capped the points of these flower beds with stones. 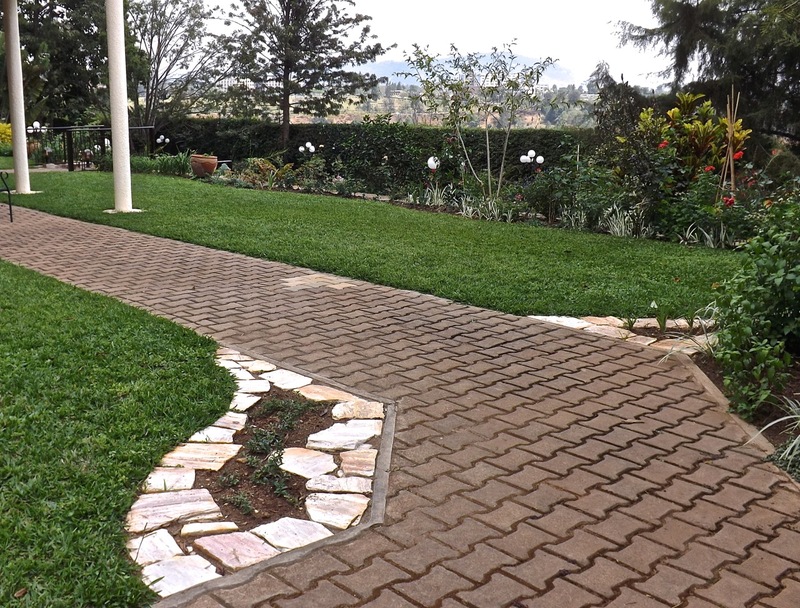 You can draw an imaginary curving line from the stone caps of the semi-circular area across the driveway to the first point of the stepping stones area at the now-open entrance to this side of the terrace (see below). A tall tree that used to grow in this area was dying and was removed in June. There are low-growing plants with blue flowers in the open areas of the stone paving, but they are still filling in and are hard to see in the photo below. It looks a bit bare at the moment, but I think it will be fine when the surrounding plants fill out and the little crape myrtle on the left grows up, and we get a tall pot or two. 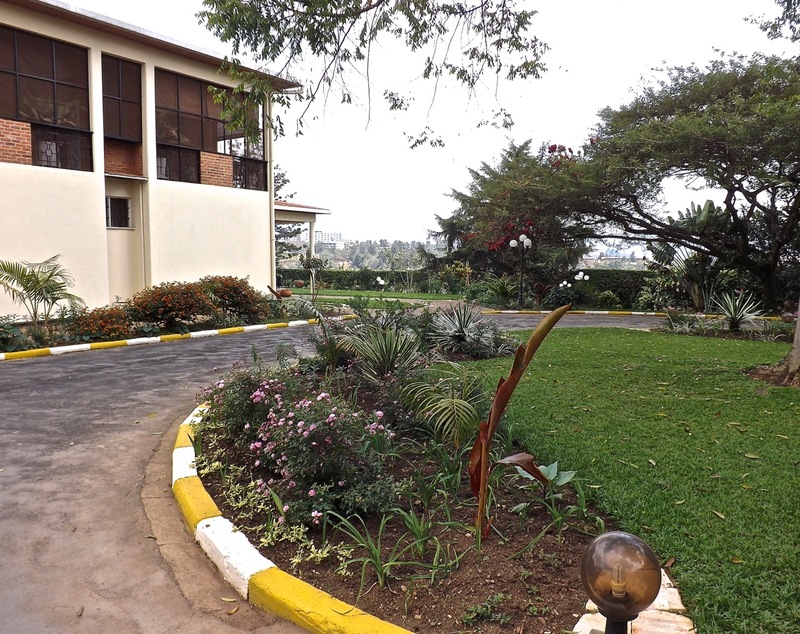 If you now cross the length of the terrace to the other side, you will see the transition to the side area of the property (see below), with the vegetable garden and cutting/herb garden. This passage used to be partly blocked by two very large shrubs. 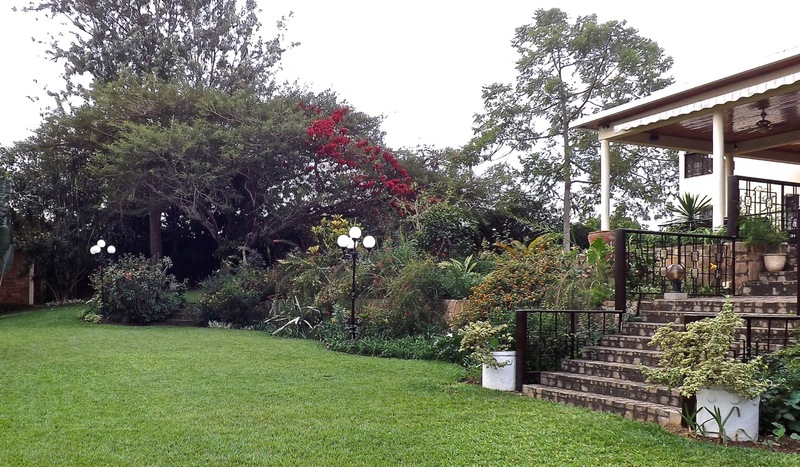 On this side of the house, shown below, we straightened up the edges of the vegetable garden, which had begun to wander, and created a wide bed to grow herbs and flowers for the house. The curving lines end here and everything is squared off, indicating the more practical purpose of the area. 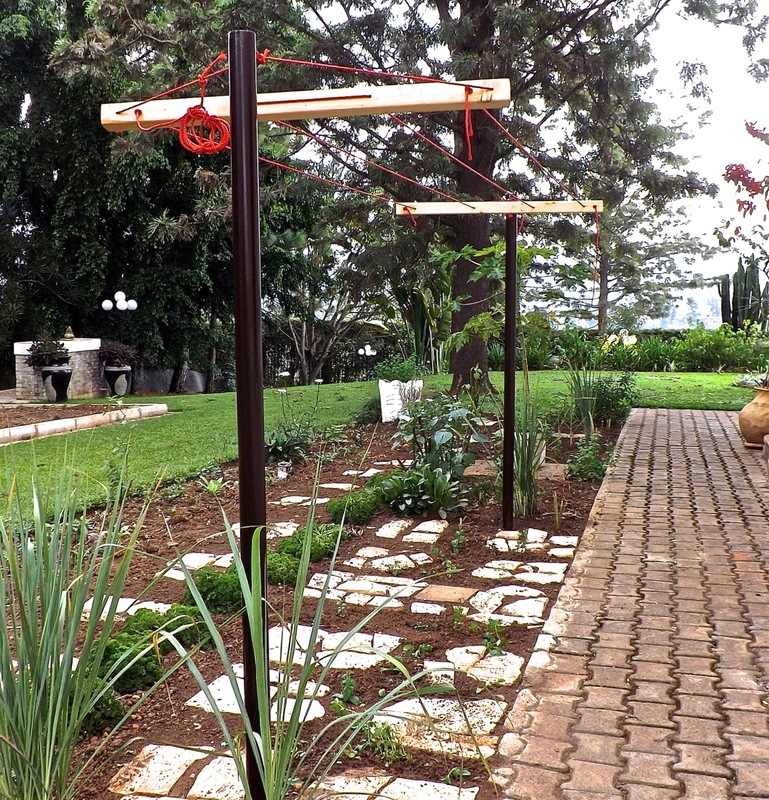 I am very proud of the new clothesline, which a carpenter built from a picture I found on Design*Sponge. The red cord was his good idea though (I still need to trim up the ends). 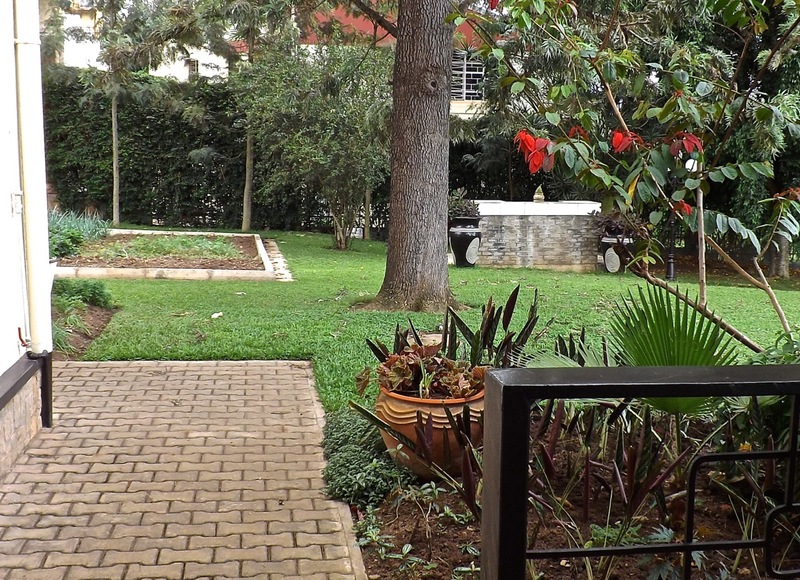 The photo below shows the view from the corner of the vegetable garden looking back to the terrace area. If you moved from that view point down along the south side of the yard to the bottom of the lower front lawn, you would be standing looking down the long view of the lower lawn, as in the photo below. This is where the idea of the curving line got its start. I wanted to add some sense of movement and a lot more volume and texture to this long, wide grassy area that needs to stay wide in order to accommodate party tents from time to time. The long border on the left side used to be a skinny straight strip that barely held the nice shrubs planted in front of the bougainvillea-covered wall. We kept almost all the various shrubs that made up the old hedges near the terrace and added them to this new wider border. The first large curve in the photo above does not “wave” out far enough. I want to widen it soon by about 2′. I want to do the same to one of the “hills” at the other end of the lawn. The proposed changes are shown by the dashed lines on the drawing at the top. Did you notice that the lampposts are no longer glaring white? They were painted dark brown, like the trim on the house and the handrails to the center steps. I am really pleased that they now blend into the surrounding foliage. At night, you just see the round white globes floating. In the last photo below, to the right and behind the traveller’s palm, is the area where we put the tall false bird of paradise that we removed from the sides of the center steps. 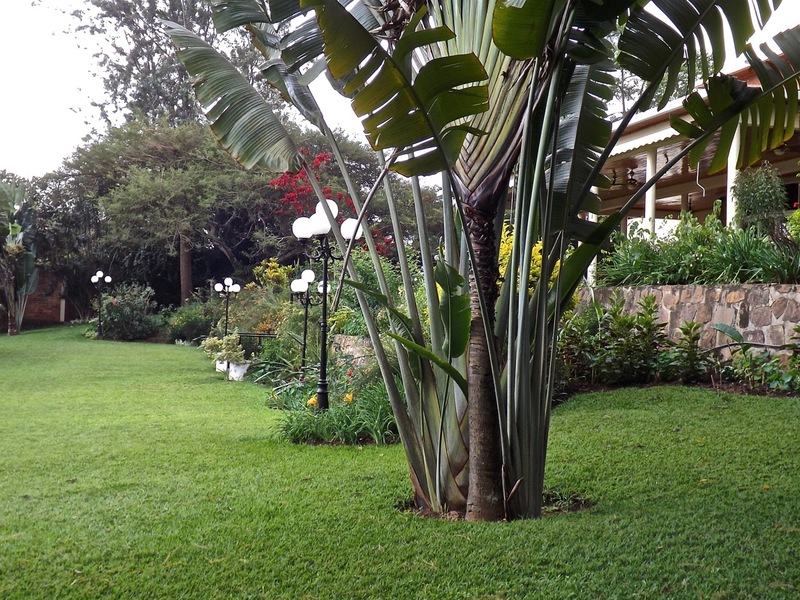 There is a similar planting at the other end of the lawn. I think they will make a nice frame for the long beds between the two stone retaining walls. I’ll write about my planting plan next month. This is just the beginning. The garden looks great. What a huge project! 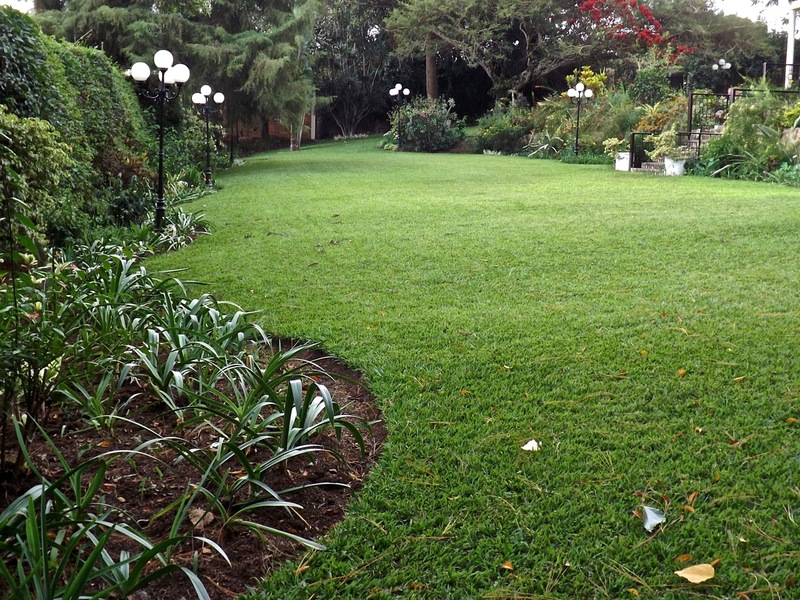 I just can’t get over how nice the grass looks. All the light and air must make for more comfort for everyone! They keep smiling. I think they think I am more entertaining than a circus, with all my funny ideas. It looks inviting and effective. I particularly like the detailed work on the tall pot. Such a sense of place focal point, and with the curves echoing the distant mountains! Looks Fantastic! I wish I could remember the “before” better though…. Looks very good and the small plants that you are concerned about don’t even matter since the big design picture seems obvious to me. Painting the railings and posts a dark color makes a positive difference. And I like how you used things elsewhere like the sod and the shrubs.